I’m very excited to announce that I have a new poem in the latest issue of Arsenika! “Only the Trees” is kind of difficult to sum up, but I will say it’s one of my most explicitly romantic poems. This entry was posted in My Fiction and tagged arsenika, fantasy, poetry on February 11, 2018 by Marina Berlin. Thank you so much to everyone who participated in the giveaway! It’s the first time I’ve done anything like this, and despite the anxiety of not getting it right and various tech fails, it went much better than I was initially anticipating! I’m especially grateful for everyone who signed up for my New Release Mailing List. It’s been kind of amazing to see people express interest in hearing from me about future projects. Anyway, without further ado, the two winners of the giveaway are Julia and Mia. You’ve both gotten an email with a copy of The Running Bunny #8, so please let me know if gmail doesn’t deliver it within the next 24 hours. Thank you, again, to everyone who participated, signal boosted and generally expressed support for the idea of me doing something like this. It’s definitely not the last time, so I’ll see you when I next have free stuff to give out! This entry was posted in Giveaway, My Fiction and tagged fantasy, the princess and the demon on June 12, 2016 by Marina Berlin. You can now, for the first time, read an original short story by me! With bonus awesome illustrations! “The Princess and the Demon” is about 2700 words of feel-good, queer fantasy about, well, a princess and a demon. It appears in issue #8 of The Running Bunny! Between now and January 31st you can get it at a discount by supporting the creators on Patreon. After January 31st you’ll be able to get it for slightly more at the digital store. 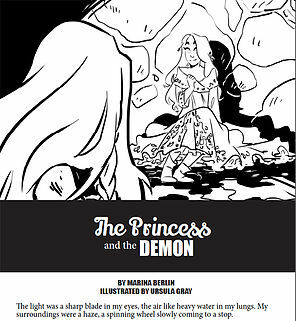 This entry was posted in My Fiction and tagged fantasy, short story, stuff to read, the princess and the demon on January 5, 2016 by Marina Berlin.